A gun safe is a highly protective asset to safeguard your firearms and other valuables. Gun safes come in different shapes, sizes, and price ranges. For this discussion, we’ll focus on the third factor - price. This article will explain the importance of a gun safe, and whether you can find a good gun safe under $1000. You’ll also learn about the ideal qualities to look for when buying such a gun safe. To make things easy for you, we have also reviewed the best gun safes under $1000 on the market, in case you need some help with buying one. 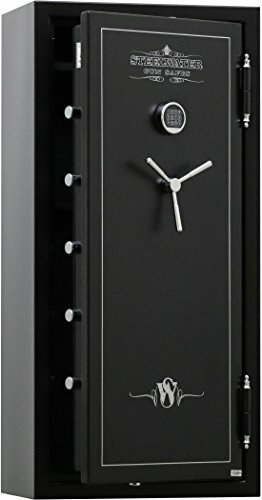 Can You Find a Quality Gun Safe For Under $1000? Absolutely, yes. An iPhone may be expensive, but it's not always the best. Similarly, the price tag is not always a guarantee of quality in a gun safe. There are gun safes on the market priced exorbitantly, but they can be pick opened with a straw. There are also safes on the market which sound cheap but can withstand a grenade explosion. However, thinking in the context of a gun safe, there are certain differences between high and low-priced models. More expensive gun safes are generally larger and made from very thick steel. They are expensive because more material, time and effort are invested in manufacturing and installing them. The price of gun safes can range from as low as $100 to thousands of dollars. Cheaper gun safes also lack in several other qualities such as fire resistance, water resistance, proper lighting, modular design, and resistance to intrusion. Gun safes below $1000 do offer such features, but only to a limited level. For example, they often have limited fire resistance and thickness, lesser mounting options, and pickable locks. Comprehensively, the price of your gun safe should depend upon the value of the contents you plan to store in it. If your firearms, documents, and valuables cost more than a $100,000, you should not even entertain the thought of the cheaper safe options. But for the average Joe, there are a lot of good options for gun safes under $1000, without compromising on quality and safety. What to Consider When Buying Gun Safe for Under $1000? The first thing to consider about the gun safe is its size. 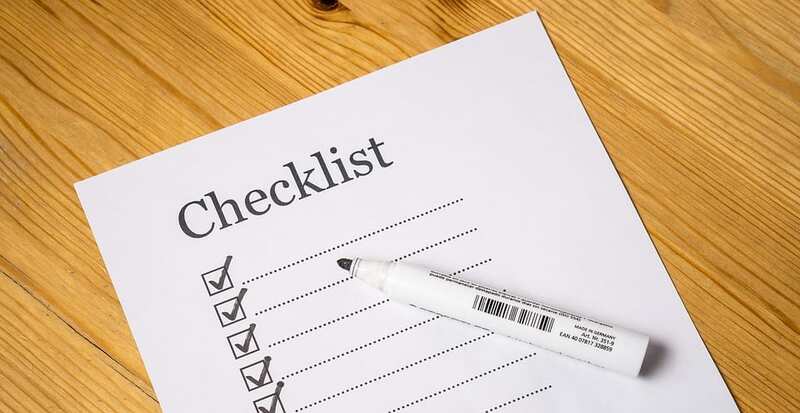 You must evaluate beforehand the number and type of items you’re going to store in the safe. Plus, you must also consider your future needs. Such as, if you plan to expand your firearm collection, or you plan to buy bigger guns or any sort of collectibles. Take note of the size and the number of items you plan to store in the safe and also consider their value and importance. ​Another important factor is the thickness of the gun safe. Commonly referred to as ‘gauge’, the thickness of a safe relates to its durability and strength. Safes on the market are available within a range of 14 (1.9mm) gauge to 0 gauges (thickest - 7.9mm) steel at a price point below $1000. More expensive gun safes tend to be thicker and provide more protection and safety. Plus, the increased thickness also imparts a heavier weight to them and makes them difficult to be moved or stolen. The locking system for gun safes in every price range are almost the same, since fingerprint scanners, combination locks, RFIDs, and dial keypads have become inexpensive and readily available these days. Although more expensive gun safes can assure you of the safety and invincibility of their locks, low-priced gun safes may sometimes lack on this. However, some safes come with multiple locks which improve their level of security. ​You must take a note of whether the gun safe you are buying has been certified on several important parameters. The most important ones to look for are the UL rating and the DOJ approval. The UL (Underwriters Laboratories) fire rating refers to the level of fire resistance of your safe. UL-350 stands for one hour of fire resistance, UL-500 for two hours and so on, plus certain other factors provide protection to paper, and magnetic disks. The DOJ approval refers to the Department of Justice Approval, which is also a quality indicating factor. Cheaper safes are not often fireproof or offer a lesser degree of fire resistance. Make sure to evaluate the UL factor, based upon items you plan to store. A gun safe must have some sort of floor and/or wall mounting options. This protects your safe from tipping, as well as from being carried away by burglars. Moreover, if your safe is heavy enough not to be able to be carried away, not anchoring it down will still give intruders a chance to tip it over and use some specialized tools over it. If your safe comes with any sort of drilling options, that is also a plus. But make sure not to drill any holes by yourself at any random position, because it may impair the fire resistant qualities of the safe. Almost all gun safes offer the option of anchoring, regardless of their price. Based upon the aforementioned factors and considerations, we have scoured the internet to find the best gun safes under $1000 on the market, so you don’t have to endure the time and frustration of comparing and evaluating a ton of different safes out there. All of the safes reviewed here have been approved by the Department of Justice (DOJ) and represent optimum and unmatched quality. Also, all of the safes mentioned in this review are large gun safes and offer the best deal for the money. The Stack-On W-40 gun safe is a large safe with ample space in it. The safe can store a maximum of 40 guns at a time. Alternatively, you can store several full-sized guns with ammunition and other valuables. The safe is entirely carpeted on the inside and has removable shelves which can be displaced according to your convenience. The Real Tree Extra Camo designed door storage is also an added benefit, as it has pouches which can be used to store handguns, holsters, ammunition, and other relevant items. The safe also features 1½ -inch locking bolts around the door which secure it firmly, plus a three-spoke handle on the outside to easily unlock the door. The gun safe features a backlit keypad-based combination lock which can be accessed easily even in the dark. It is UL fire rated and can withstand temperatures up to 1400 degrees Fahrenheit for up to 30 minutes, which makes it appropriate for storing firearms, jewelry, and documents. The safe can be bolted down to the ground using two pre-drilled holes and runs on an alkaline battery. The Stack-On W-40 is a spacious safe with a humongous storage capacity. It has a thick construction and a safe locking mechanism, which can be accessed easily at night. The extra door storage is also a plus. The safe is also fire rated and can be anchored to the floor using two pre-drilled holes. Steelwater has long been known to manufacture large, heavy-duty gun safes, like this one. 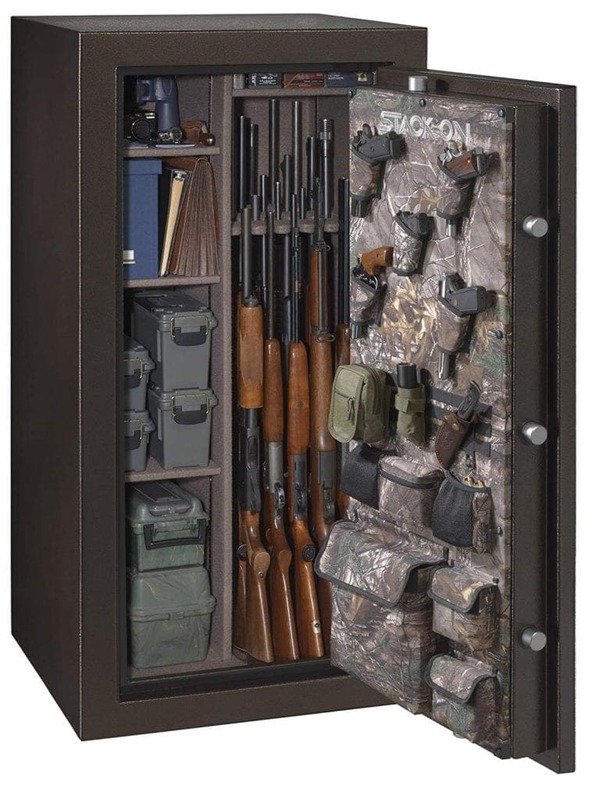 This safe has a maximum storage capacity of 20 long guns, which is 12-16 under normal conditions with additional items. The front door of the safe is 4¾-inches thick with two layers of fireboard. Ten 1.5-inch locking bolts secure the door in place, and a drill resistant hard plate makes it almost immune to any forced entry. 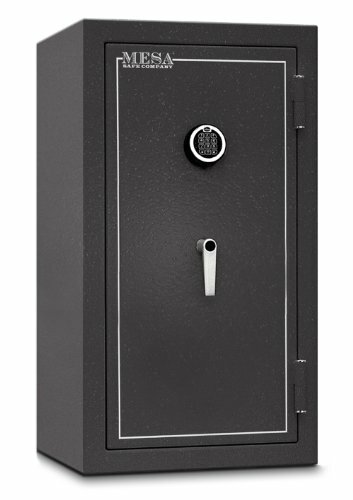 The safe is carpeted on the inside and features racks which can be displaced when needed. An EMP-proof, keypad-based lock ensures that the locking mechanism cannot be bypassed by any means. Additionally, the two double-sided backup keys also ensure that you don’t get locked out of the safe. It also has a fire-resistant seal applied all around the doors, which expands in case of a fire, hence sealing the contents inside. The safe is UL rated for protection against temperatures of 1875 Fahrenheit for up to 60 minutes. It also has four pre-drilled holes and a dehumidifier hole, so you don’t have to modify it. In other words, this safe is a tank for your weapons! The Steelwater Gun safe is a sturdy storage option for firearms, documents, and other valuables. Its door is heavy-duty and pry resistant, plus the door organizer, EMP-proof lock, and anchoring holes add to its functionality. The Barska Large Biometric Safe is a thin, compact storage unit and is good for normal everyday use. The safe has a five deadbolt locking mechanism, which makes it very difficult to pry open. The door is secured by a fingerprint-based biometric lock, which can be programmed for up to 120 different fingerprints. The lock operates in both silent and audible modes. Plus, you always need an already verified user to change or add a fingerprint, which is an exceptional security measure. Moving to the interior, the safe can store a maximum of six long guns, along with some other handguns and ammunition comfortably. However, the manufacturer claims it can store 12 guns at max. The interior of the safe is lined with felt and has removable racks which can be adjusted for storage. The safe can be anchored down to any surface which is also an advantage, especially for a lightweight safe. The Barska Safe is a lightweight, compact long gun safe which can be used to store firearms and valuables. Its slim construction allows it to take up less space, which is a plus. The biometric lock is robust and secure. The only drawback is that the safe is not fire-resistant which prohibits it from being used for extreme safety. This gun safe from MESA is a huge, secure container to safeguard your valuables. The safe has a 4 ½-inch thick front door secured by five lugs, which make it resistant to prying. The battery-operated electronic lock is easy to access and open. The safe itself is heavy enough not to be stolen and light enough to be moved with a dolly. It will hold most modern sporting rifles with a collapsible stock and 16" barrel. The interior of the safe is carpeted and has two shelves, which can be removed to create a single storage section. 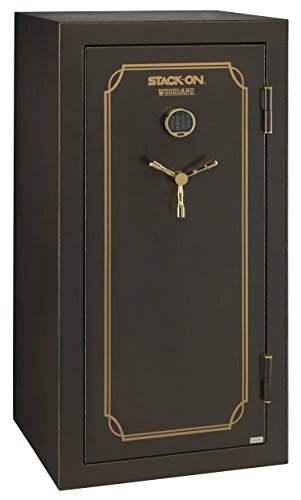 It has pre-drilled holes for easy mounting and is a two-hour, fire-rated safe. The perimeter of the door has a heat-activated seal which expands in case of a fire outbreak. The Mesa safe is the ultimate choice for storing guns, jewelry, magnetic disks, papers, and other valuables due to its size, locking mechanism, and effective resistance to natural threats. A gun safe doesn’t always have to be expensive. There are lower-priced models which offer spacious storage and protection against manual and natural threats. Before buying a gun safe, you must take into consideration its size, thickness, locking mechanism, certifications, and anchoring capability. Plus, you must also consider your future use, so you don’t have change and buy a new safe at regular intervals. Investing in a good gun safe will protect you and your valuables under extreme circumstances.